While fish is baking, dice the remaining garlic half and saute in olive oil with the bell pepper for two minutes over medium heat. Add tomato and basil and continue to saute for another three minutes. Spoon sauce over salmon fillets and serve. 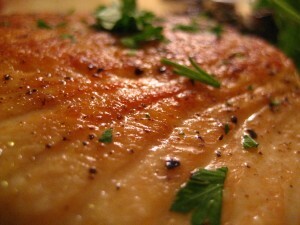 Salmon is a great source of Omega 3 and low-fat protein. Salmon is a great choice for a heart-healthy diet.